Our easy 3-Step Process makes it simple for you! 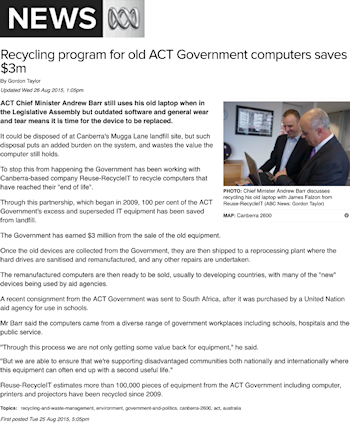 Reuse-RecycleIT is an Australian company specialising in the facilitation and logistics management of recycling and reusing end-of-life IT and office equipment. Many organisations would like to have their old equipment reused or possibly even resold to realise a disposal value, but don’t have the time or expertise to organise this. Reuse-RecycleIT can help! Turning YOUR used IT and office equipment into returns. Collecting from every Australian Capital City and Australian Major Regional Centre. Meeting ISO 14001: 2015 Environmental Management Standard : this is our guarantee to you that we do it right. Leveraging more than 17 years experience in “Working in Partnership” with Governments and Education asset lifecycle programmes. 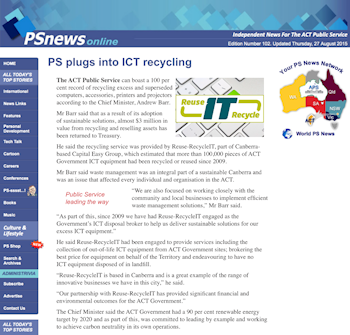 Reuse-RecycleIT is part of the Capital Easy Group and is an Australian company specialising in the facilitation and logistics management of recycling and reusing end-of-life IT and office equipment. 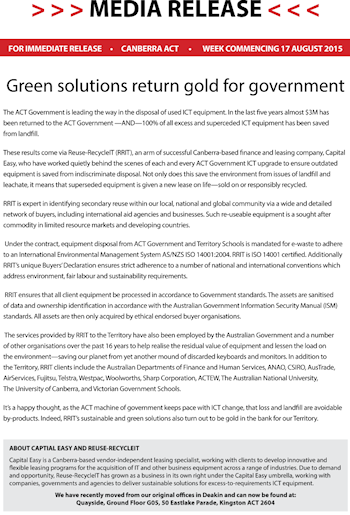 Our Canberra-based company brings together a talented team of professionals with many years of combined experience dedicated to providing customers nationally with a vendor independent, efficient and effective IT asset disposal solution. 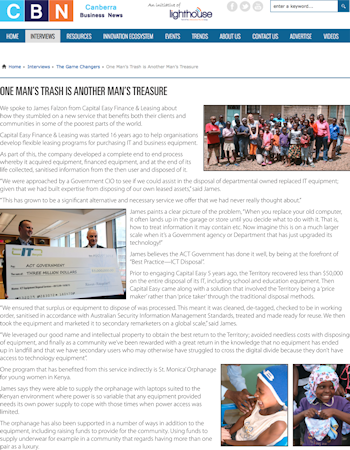 Reuse-RecycleIT is committed to a cleaner environment through e-waste recycling. We hold Environmental Management Systems (EMS) certification and maintain the “Recycler’s Pledge of True Stewardship” through the use of a purchaser’s declaration. We are specialist equipment-disposal brokers, and we have developed a worldwide network of equipment reuse companies to achieve the highest possible return values to customers and the highest credentials for redundant equipment to be reused throughout the world. Set and review environmental objectives and targets based on the nature, scale and environmental impacts of our company’s activities, products and services. Commit to comply with environmental legislations and other environmental requirements. Ensure continual improvement, prevention of pollution and the conversation of resources. Reuse-RecycleIT’s policy is to be a responsible corporate citizen in protecting the environment. It is committed to complying with accepted environmental practices, including meeting or exceeding all legal and social requirements, aiming for continual improvements to our EMS and minimising the creation of waste and pollution. We manage our processes, materials and people in a way that will reduce the environmental impact of our business activities. Reuse-RecycleIT pledges to implement and operate the ISO-14001 EMS to the full as a way to further enhance out environmental performance. This very simple philosophy has been the core of the Capital Easy Group for the last 17 years. We understand, as do our customers, that the world’s best is only the “best” when implemented by a professional organisation that understands the outcomes required by its client. 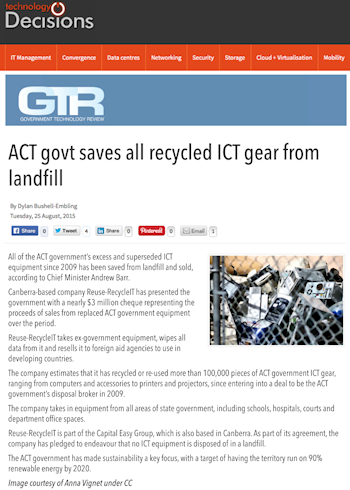 Reuse-RecycleIT understands the life-cycle process of ICT and we work with our clients to provide the best solutions available. Reuse-RecycleIT is a specialist equipment disposals broker and have developed a worldwide network of equipment reuse companies to achieve the highest price possible and the highest credentials for redundant equipment to be reused throughout the world. Reuse-RecycleIT was developed to compliment the services of Capital Easy Finance & Leasing. Capital Easy have been working with their customers for over 17 years to achieve the lowest asset life-cycle replacement costs. Reuse-RecycleIT further strengthens this position. 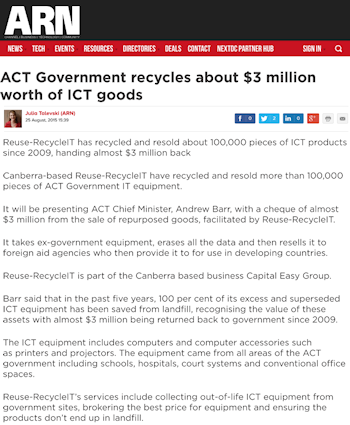 Reuse-RecycleIT can be used as a stand alone service by any government, education or business unit. complete asset lifecycle solutions for government and corporate clients alike when partnering with the Capital Easy Group. Please contact us if you are unsure of the suitability of any other items. Identify the equipment you have for collection. For example: look for equipment that is already redundant, equipment in storage gathering dust or equipment identified for renewal. Complete an equipment manifest listing. Click here to download a sample spreadsheet template. Contact us on +61-2-6282-7844 or via RRIT@Reuse-RecycleIT.com.au for more information. We look forward to discussing how we will meet or exceed your expectations. Reuse-RecycleIT will arrange a pick up time for collection and transportation of the equipment from one of our collection depots. Services are available nationally across all Capital Cities and Regional Centres. All equipment is individually assessed and tested. 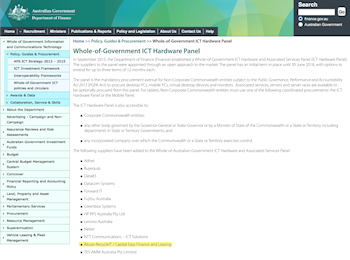 All hard drives can be sanitized to Australian Government Standards. 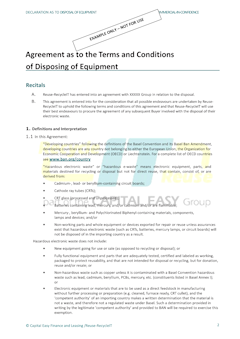 A final equipment report and sanitisation certificate will be available to you with the proceeds of your equipment. and also a sample of the “RRIT Disposal Declaration” (available upon request). What is the RRIT Disposal Declaration? 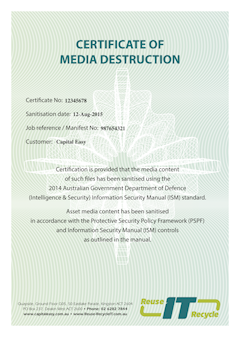 It is our way of ensuring strict adherence to Australian Government and global disposal protocols — e.g. International Basel Convention http://www.basel.int on the Control of Trans-boundary movements of Hazardous Wastes and their Disposal and the Waste Electrical and Electronic Equipment Directive. Such a practice cannot be controlled by an auction methodology. We as the seller on your behalf hence qualify buyers of equipment — a process that Reuse-RecycleIT embodies. In addition, electronic components contain valuable raw materials, such as copper, iron, silicon, nickel and gold, which until recently were needlessly squandered through careless disposal. Personal computers, monitors, laptops, printers and many other associated computer equipment often contain chemicals within plastics and circuit board designed to prevent the device catching on fire. While this seemed like a good idea at the time, the chemicals used are highly carcinogenic and are not broken down naturally in the environment. Hence whilst getting a return on sale is important, it is equally responsible, that as a community, we do so mindful that sustainable reuse or remanufacturing will ensure maximum returns to both the seller and our environment. The RRIT Charity Donation Plan (CDP) provides your organisation with an easy way to donate a portion (as little as 1%), or the entire proceeds of sale of each ICT disposal manifest processed by RRIT. 100% of your donation will assist a charity, community, school or workplace staff facility of your choice, or one of the four affiliated charitable funds listed below. Participation is easy—giving is optional. Donated proceeds of sale over $2.00 to the charitable funds listed below are tax deductable to your organisation, and a receipt will be provided. Click here to view (or download) the “Charity Donation Plan” PDF document. Click on PDF Brochures above to view! Capital Easy acknowledges Aboriginal and Torres Strait Islander Peoples as the First Australians.